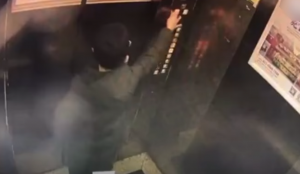 When You Urinate on an Elevator Control Panel…Guess what happens! Take a look at this genius! This kid in China doesn’t know how electronics work. 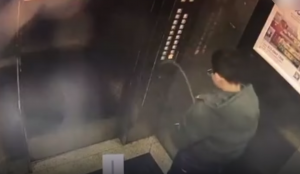 A boy in China decided it would be a good idea to play a practical joke and urinate all over the control panel of an elevator in which he was a passenger. Funny joke right? Now for him. Like most sick jokes this one also backfired on the kid who is also most likely to win a Darwin Award some day. Surveillance video captured the whole event as he made sure to cover the entire panel with his urine, frequently adjusting himself to make sure he covered every button. He was probably hoping that the next passengers would be required to unknowingly touch his pee when they selected their floor number. But here’s the problem…as most folks know, water and electronics don’t exactly mix. His elevator ride became extended when his urine short circuited the control board inside the elevator panel thus causing the elevator to malfunction and shut down…trapping him inside his own self made prison. Then our young prankster proceeded to touch every single button that had been doused with his urine in an effort to free himself from his self made prison. 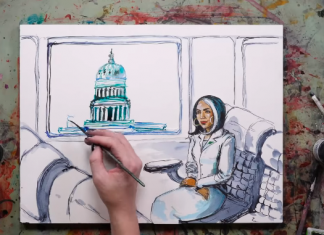 Ahhhh….what a genius. The authorities finally rescued him from the elevator but we don’t know if he faced punishment. But hey…it’s China…so we can assume he’ll be soon peeing on a rock in a labor camp. Previous articleBullet-wounds and the Father-wound! Next articleWill the Real Cowards Please Stand Up?